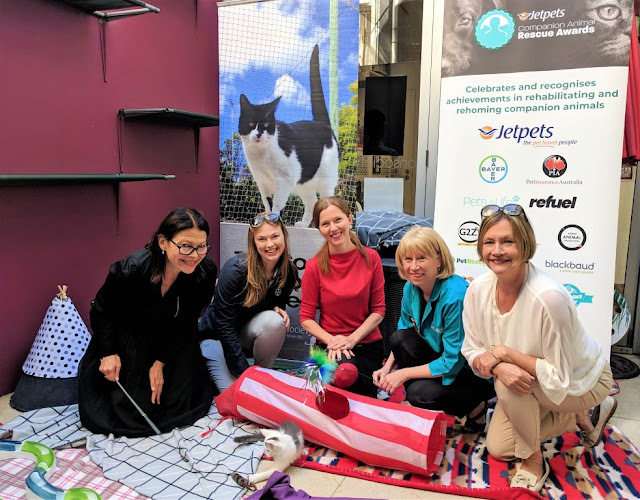 One of the kittens at the launch of the 2019 Jetpets Companion Animal Rescue Awards at the Cat Protection Society. Do you rescue, rehabilitate and rehome companion animals in Australia? 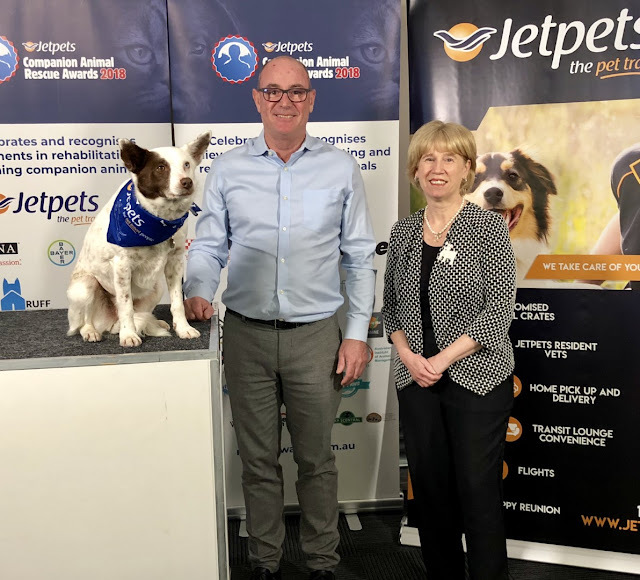 If the answer is yes, you can enter the 2019 Jetpets Companion Animal Rescue Awards. I was a judge on the panel in 2018, and have joined the 2019 judging panel again as this was an amazing experience. Last year there were 517 entries, and reviewing a selection of these gave me great hope for the companion animal population served by these dedicated groups. Rescue Awards founder, and rescue advocate from Pets4Life Cathy Beer, established the awards to celebrate and recognise achievements in companion animal rescue, rehabilitation and rehoming, and to encourage innovation in this space. “Every year, 186,000 pets remain unclaimed in Australia’s pounds and shelters, and thousands of volunteers support over 900 rescue and animal shelters across Australia¹,” she said. 1. Nell Thompson, Coordinator for Getting 2 Zero (G2Z) and Secretary of the Australian Institute of Animal Management (AIAM). 6. Dr Anne Fawcett, animal welfare veterinarian. 8. 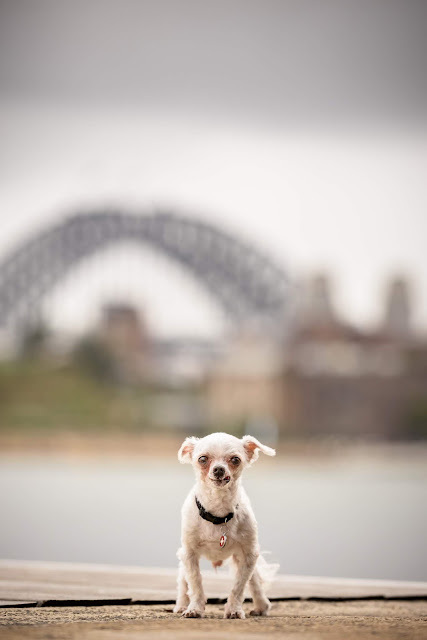 Dr Alex Hynes, Emergency Veterinarian and co-star in the new series of Bondi Vet TV show. Has your dog or cat worn an Elizabethan collar (e-collar) in the last 12 months? Has your dog or cat worn an Elizabethan collar (often referred to as an e-collar) in the last twelve months? We'd love anyone living with a dog or cat (including vets or vet nurses) to help us by answering a very short survey. E-collars, are applied to prevent animals from accessing particular areas of their body. 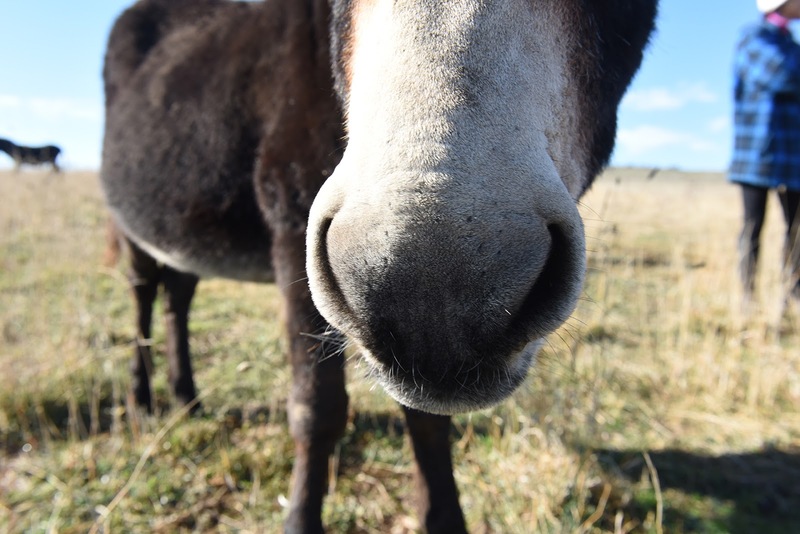 For example, they may be applied after surgery to prevent an animal from licking, biting or chewing a surgical site on the body until it has healed, or to prevent the animal from scratching, rubbing or otherwise injuring the eyes or face. 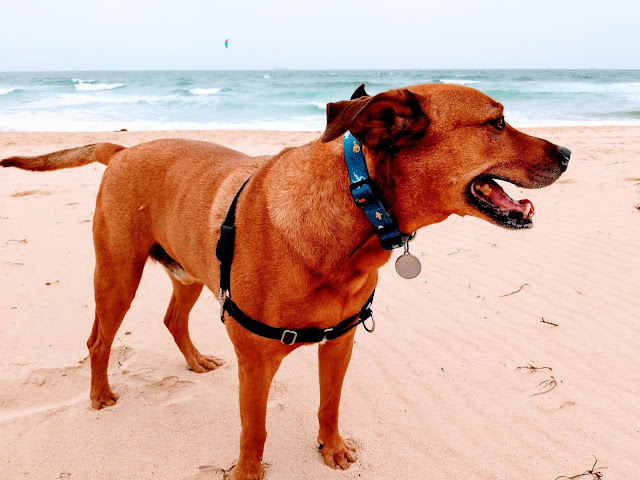 Different types of e-collars are available, including hard plastic, soft plastic, inflatable collars. They come in a range of sizes, depending on the size of the patient and the area of the body that requires protection. 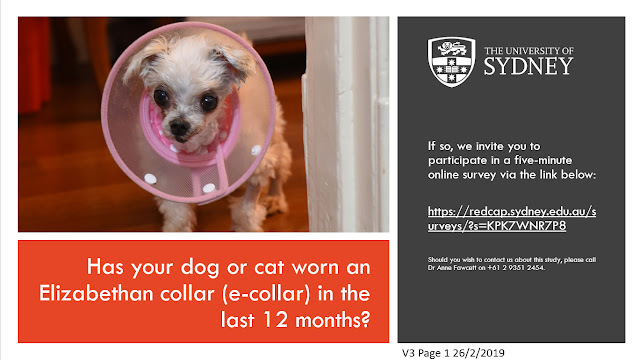 Researchers at the University of Sydney, including myself, are seeking to find out how Elizabethan collars impact the behaviour and welfare of animals wearing them. Owners of dogs or cats whose pet wore an Elizabethan collar in the last 12 months are invited to complete an online survey which will help us understand the effect these collars have on the animals that wear them. Phil, captured by My Dog's Territory. It is in a state of not-quite-acceptance that I post that my dog Phil died yesterday. It feels surreal. He was a very senior dog (how senior I will never know – although I would estimate a solid 16 and possibly beyond). He had multiple co-morbidities, and he was well compensated until yesterday when he crashed. Somewhat poetically, the very day before, Phil became part of a First Dog on the Moon cartoon which I feel is important to share here. Its hard to write anything beyond that right now. Except to say that the void he has left is disproportionately larger than his 1.8kg form. And he was loved beyond measure. Record-breaking temperatures are the new norm. Just like us, animals suffer with the heat. Each time a heatwave approaches, I am asked for advice about how to prevent heat stress in animals. 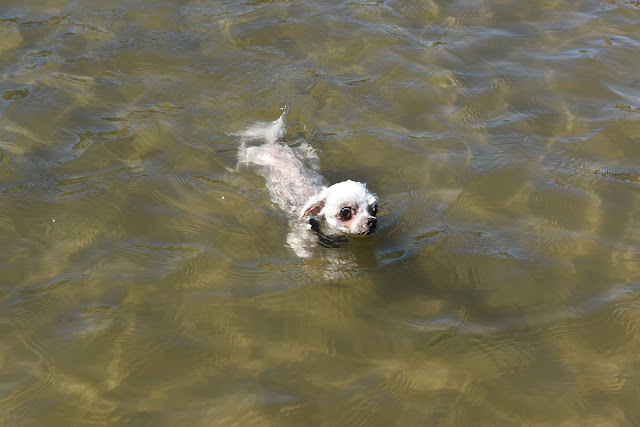 The practical tips that pet owners can take to protect their animal companions range from ensuring animals are have appropriate shelter that protects them from the heat to providing fresh, clean, cool water for drinking and (for some species) bathing. But beyond the steps needed to protect animals in a heatwave, it is vital to understand that extreme weather is becoming the norm. It is no longer the exception. Protecting animals from heat stress is no longer a matter of planning for companion animals for a handful of odd hot days over summer. We need to recognise that climate change is making heatwaves more severe and frequent, and that we need to stop climate change to stop things from getting unbearably hot for animals, humans and the environment that sustains us. Aside from the risk of heat stress, extreme weather is associated with a higher bush fire risk. Bush fires are associated with high morbidity and mortality rates of animals (particularly wildlife but also livestock and sometimes companion animals). The evidence is clear that our climate is changing. 2018 was Australia’s third warmest year on record, and also had the earliest ever total fire ban ever declared in NSW. Nine of Australia’s hottest ten years have occurred since 2005. In the short term we need to cope with the heat, but we also need to take immediate action to tackle the root cause of the problem: burning fossil fuels for energy, which produce the greenhouse gas pollution that contributes to climate change. We need to urgently phase out polluting coal, oil, and gas in favour of clean and safe renewable energy if we are to protect Australia’s animals (companion animals, farm animals and wildlife), humans and the environment we occupy in the longer term. This truly is a One Welfare issue and we need to prevail on politicians to tackle this problem. If you’re not convinced, here are some trends reported in the Bureau of Meterology’s Annual Climate Statement (you can view it here). 2018 was Australia’s third-warmest year on record (recording started in 1910), with an area-averaged mean temperature that was 1.14 degrees Celsius above the 1961 – 1900 average. Longer term, the 11-year mean average temperature for 2008-2018 was the highest on record (0.77 degrees Celsius above average). What does plastic in the ocean have to do with companion animals? Bosca models the AniPal collar, made from recycled plastics (NB harness is not related). What does plastic in the ocean have to do with companion animals? Quite a bit, actually. According to the World Economic Forum, by 2050 there will be more plastic in the ocean than fish (although there are a coupleof key steps we can take to slow this down) That will destroy the ocean we enjoy, impacting aquatic and terrestrial environments. It will also remove one of the world’s major food sources. Microplastics ingested by fish have already made their way into the food chain, the consequences of which we don’t fully understand. 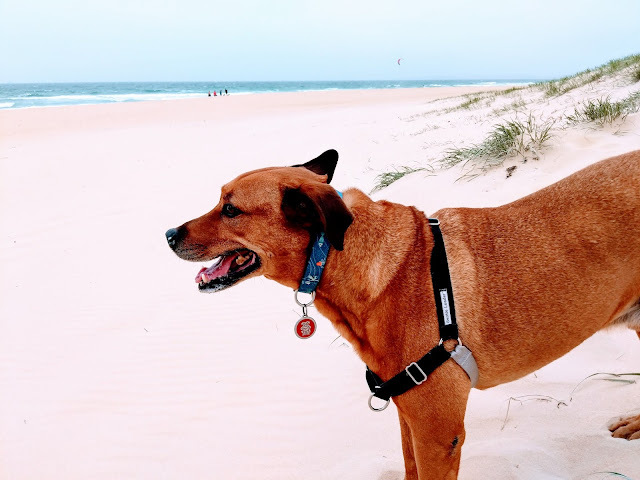 Veterinarian Stephanie Stubbe was horrified by these figures, and spent over twelve months setting up her own company to repurpose plastic ocean waste, converting this into dog collars and leads which are now available in Australia. I learned about Dr Stubbe when colleagues began sharing an ABC news article about a young vet who had decided to tackle something many of us think is too hard. We later spoke when I was writing an article about the animal welfare impacts of plastic in the ocean. Bosca models his recycled plastic collar (harness not related). 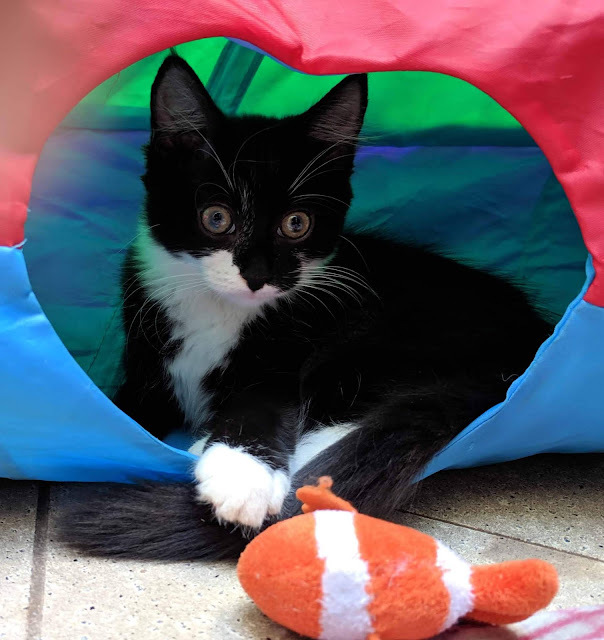 We tend to think about companion animals as living in homes, protected from the wider environment. But as we deplete and damage our environments, we need to appreciate that they, like us, are part of a bigger picture and animal welfare, human wellbeing and environmental sustainability are interdependent. And thinking about reducing the “plastic footprint” of pets might challenge some of us to think about our own plastic footprint. We can also reduce that of others by participating in initiatives like Take 3 (a campaign that encourages people to take home at least three bits of litter every time they hit the beach). Initiatives like this are based on the premise that small choices we make in our everyday lives have the power, collectively, to make a difference. 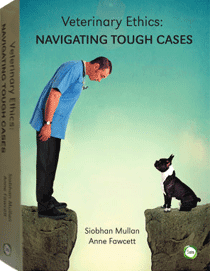 It will be interesting to see what other initiatives animal health professionals develop to tackle these wicked problems. You can follow Dr Stubbe on Instagram or facebook. Declaration: The collar modeled was purchased from AniPal and this is not a paid post, not has it been reviewed or endorsed by AniPal. Happy New Year! If 2018 taught us one thing, its that there is much to do to address some of the world’s greatest challenges: improving animal welfare, human well-being and environmental sustainability. It can all seem a bit too hard, but the good news is there are plenty of capable people swimming against the tide and working to facilitate environmental, human and animal flourishing. “One Welfare” is the term used to describe the interdependent relationships between all of the above. It is based on the premise that we need to address all stakeholders – human, animal and environment – rather than focusing on one or two at the cost of another. In 2019 the University of Sydney is hosting the Second International One Welfare conference. Keynote speakers include Professor David Fraser, from the University of British Colombia (hear him talk about One Welfare here), Rebeca Garcia Pinillos, founder of One Welfare World (read her book about One Welfare here), and Dr Mark Schipp, Australia’s Chief Veterinary Officer and President of the World Animal Health Organisation (OIE) (read the OIE's Global Animal Welfare Strategy here). If you are working in this space, you can submit an abstract for consideration by January 31. For details, check under the “submit an abstract heading” here. Or if you’re just keen to come along and meet others, including veterinarians, in this space, you can register here. Declaration: I am one of the volunteer co-organisers of the One Welfare Conference. I also volunteer with the CVE and present veterinary CPD for them from time to time.